I’ll be dating myself, but you remember Rodgers and Hammerstein’s Cinderella, right? You know. The one with Leslie Ann Warren and Stuart Damon that we all watched when it was televised once a year on CBS when we were kids? Well, put your memories aside. That is not the show getting a tour stop at the Bushnell this week. This Rodgers and Hammerstein Cinderella is the version that finally marked the musical’s debut on Broadway in 2013 with an updated book by Douglas Carter Beane (Sister Act, Zanadu). Now don’t get me wrong. While Oscar Hammerstein II is a gifted lyricist, his book-writing skills often leave a lot to be desired. In fact, the original book for Cinderella (written for a 1957 television broadcast starring Julie Andrews) is one of the worst books of a musical I have ever read. Thankfully it was changed for the 1965 Leslie Ann Warren version which became a regular part of millions of baby boomers’ childhoods. It was updated again in 1997 for a TV movie starring pop music star Brandi. 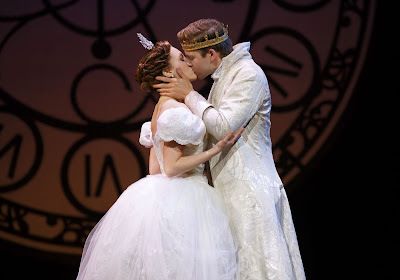 But when the musical finally made its way to Broadway (starring the beautifully voiced Laura Osnes), the producers apparently felt that America had changed too much to be delighted by a fairy tale in which a poor girl magically gets a chance to be a princess. Oh, no, now we have to be politically correct and make sure little girls (and there were lots of them in the audience all dressed up and looking so cute opening night) understand that citizens should protest injustice and that princes are part of the 1 Percent and shouldn’t keep all that money to themselves and that even a Fairy God Mother is just a homeless woman whose magic is for everyone if you show a little kindness…. If you’re wondering whether this should be called Occupy the Musical, directed by Mark Brokaw, take heart. There still are wonderful Richard Rodgers tunes to enjoy. Even with the music, there are some disappointments, however. Music Director Bruce Barnes conducts some of the tunes at an annoyingly slow pace. “Gavotte,” which usually excites and swells as courtiers dance around the ballroom (choreography is by Josh Rhodes), falls short, almost as if influenced by a social agenda requiring it not to call too much attention to itself. The ball also is kind of a letdown, as Beane felt the need to alter the story and the whole losing-a-glass-slipper-at-the-stroke-of-midnight scenario for no apparent reason. In his quest to update the story, however, he fails to recognize that the thought of a whole kingdom of women getting excited about being paraded in front of a prince for his selection is hardly politically correct. It’s a fairytale. Chill…..
Kaitlyn Davidson as Ella -- yeah, even their names can’t stay the same. The Prince (Andy Huntington Jones) is Topher, short for Christopher. Why? No clue. But I digress… Davidson is charming and has a lovely voice. The step family. One change in the story I do like: shy Gabrielle (Kimberly Fauré) refuses to go along with her mother’s abuse of her stepsister and takes a chance to enjoy love with social protester Jean Michel (David Andino). Fauré displays a talent for dry humor. Aymee Garcia is a hoot as obnoxious Charlotte. I even like that Beane made the stepmother, Madame (Blair Ross), really cruel. It makes Cinderella’s forgiveness that much more poignant. Chauncey Packer’s operatic delivery of “The Prince is Giving a Ball” is one of the more exciting moments. He also delivers a funny line later in the script and stands out in a minor role. Anna Louizos’s enchanting set and cute little forest creature puppets. Costume magic by Designer William Ivey Long (who won the Tony for this) and Lighting Designer Kevin Posner. Watch for the rags to turn to a ball gown and for the gown to become rags again right before your very eyes. Now that’s a fairy tale! Blake Hammond as Sabastian, a corrupt prime minister, who manipulates the young prince’s power to take advantage of his subjects. A Broadway vet, he grounds the show. Enjoy a lovely (if politically correct) night with Cinderella at the Bushnell, 166 Capitol Ave., Hartford, through Jan. 17. Performances are Tuesdays, Wednesdays and Thursdays at 7:30 pm; Fridays and Saturdays: 8 pm; Saturdays at 2 pm; Sundays 1 and 6:30 pm Tickets $32-$107: (860) 987-5900; www.bushnell.org.